Welcome to The Fourth Wall, CHIRP's weekly e-conversation on cinema. This week's subject is the Netflix feature The Levelling. You grew up in Nebraska, right, Clarence? I have to imagine that all around, there were glistening fields of crops as far as the eye could see? Admittedly, I've never been to the Cornhusker State, but such is my impression of most everything west of the Chicago suburbs... at least, until you hit the Rockies or so. Even for an urbanite like myself, the landscapes I'm envisioning are rather majestic. The farm depicted in 2016's The Levelling? Far from majestic. Did we see the sun emerge even once here in the English county of Somerset? The farmhouse sits rotting after a flood, with its former inhabitants evacuated to a nearby trailer home. Cows shuffle dutifully to and fro, through muck and mire. 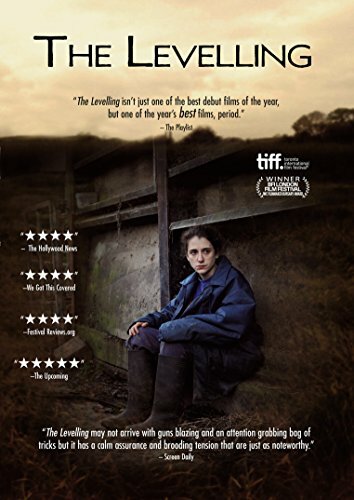 Returning to her rundown family farm is veterinary student Clover (Ellie Kendrick). Her brother Harry has just died via a self-inflicted gunshot wound; he had been drinking -- was it suicide, or an accident? No one seems to give a convincing answer either way. Money problems abound, with Clover's father Aubrey (David Troughton) in dire financial straits. Also telling? Clover refers to him by his first name, and shows a decided lack of warmth towards him and her brother James (Jack Holden). As we'll find out, there's good reason. One quickly gets the sense that Clover is tough. She's been on her own from an early age, and takes it upon herself to dig into the mystery behind her late brother's death, in between salvaging what remains of the farm. Her father seems resigned to bury his grief and disappointment behind a veil of liquor, a habit that seems long-standing. Despite clocking in at just 83 minutes, The Leveling remains a bit of a ponderous film. Is the payoff worth the journey? I haven't decided. Kendrick and Troughton are both terrific as estranged relatives, and director Hope Dickson Leach does a fine job of supplying a low-level sense of dread throughout the tale. And yet, I wonder whether the total doesn't quite equal the sum of its parts. Clarence, what did you make of the film, and in particular, the relationship between Clover and Aubrey? Also, the plight of the small farmer seems to be universal, but is there anything about the story that made it feel decidedly "British" (well, besides the lingo) as compared to Hollywood tales? Aw, shucks, pardner...! It's true, I was born and raised in Nebraska. There were lots of fields full of various grains. But I lived in Omaha, the largest community in the state. The best description of it I've ever heard is that it's either the smallest big city or biggest small town in America. Either way, I had an urban experience growing up. It doesn't take long to drive to a farm, though. They aren't pastoral, especially the ones that are mass-producing grain and livestock. You need to go back east to Pennsylvania for that kind of thing. The atmosphere in The Levelling is pretty close to what I remember from going on school field trips. Unfortunately, film can't capture the smell of hundreds of animals living and going to the bathroom on the same plot of land. That's what I remember most. I definitely don't remember Nebraska farmers having to exterminate badgers on a regular basis, though. That was weird, and might be specific to UK farming. Knowing nothing about how farms work, I can't say for sure. I agree with you, Kevin, about the overall heaviness of the film. I asked myself "OK, so....what?" at the end. The montage sequence at the opening didn't work for me. I felt set up for something more sinister than what eventually happened. This might be a bias on my part; Isolated locales like farms are great places for movies depicting people doing unspeakable deeds (e.g. In Cold Blood). Story-wise, the mystery of why James killed himself ultimately took a back seat to questions about Clover and Aubrey's relationship. I thought Troughton did a good job with a slightly underdeveloped role, switching from conviviality to rage and despair on a dime. But Kendrick's characterization of Aubrey had me wanting to know more about her. She's a very interesting character. The longer I watched the film, the more engaged I became with her along with the details and rhythms of the world it showed. But in the end, the hour and change I spent with this story felt like more than enough time. This got me thinking, are there any great farming films? The idea of "saving the family farm" has been used in the past, but can you recall any good movies or TV shows that are based around agriculture? Also, would you ever consider living on a farm, as a gentleman farmer or otherwise? I've often joked that if armageddon ever strikes and we revert to an agrarian economy, I'd be forced to try and sing for my supper. Despite holding a degree in mechanical engineering, I'm the most un-mechanically-inclined person I know; forget dealing with farm equipment, it'd be all I could manage just to avoid getting trampled underfoot by my livestock. Not to mention the fact that I'd probably only be comfortable working in a stable if I were wearing a HazMat suit. And I suppose that if I were rich enough to own a "gentleman's" farm, I'd rather use the space for some fancy landscape architecture instead? Along with a tennis court. Long story short -- while I enjoy tranquil surroundings, the rustic life is not for me. Hmm, television and cinema that has been based around agriculture? Thanks to an older sister, I watched a bit of Little House on the Prairie as a wee lad! Though I can't say that this was exactly riveting storytelling -- and even back then, farm life did not seem appealing. Aren't there always a zillion things that can go wrong? Droughts. Sick animals. Crop-killing frosts. Getting buried in one's grain silo. And so on. As far as cinema, Field of Dreams was the first thing that came to mind. Obviously, it's a baseball-centric film, but Ray Kinsella's (Kevin Costner) farm was practically a character in itself, and the movie oozed innocence and country charm. Plowing up a parking lot to build a baseball diamond wouldn't have worked -- it had to be ensconced in a farm. Kinsella was also right in Costner's wheelhouse as an actor; he practically built his legacy off of "Americana" roles (Dances With Wolves) and crumbled when he departed from that (cough, Robin Hood). On a food-related note, there have been a number of documentaries in recent years that deal with the nature of modern farming and the impact on our diets and health. Food Inc. is probably the best-known film of this group? I wonder if corporate farming is simply sausage-making on a macro level; we all enjoy the end product, but would prefer not to know too many of the details. How about you, any particular farming tales come to mind? And do you think it's an issue that we're so far removed from our food in the 21st century? This much is true: farming is tough work, where one has to march on regardless of the whims of Mother Nature. Have we grown weaker as a society the more we've vacated this world? That's an interesting question. On the one hand, thanks to technology and chemistry (fertilizer, pesticides, etc.) food has never been more plentiful in the United States. In fact, the United States throws away 1/3 of the food it produces (a rather shameful stat, IMO). Starvation is no longer a issue of production. It's an issue of distribution. Also, with these advances, we just don't need as many people to be farmers in our society. The image of the solitary, determined, salt-of-the-earth tiller of soil really is becoming an anachronism. On the other hand, turning food production into an industrial process has created the same problems as with any other factory. For example, what to do with the waste products? Illinois and other states have serious problems figuring out what to do with all the natural by-products of thousands of pigs corralled into industrial-size pens. There has been a rise in organic and artisanal production to satisfy the market for "clean" food. The overwhelming majority of us, though, don't care about the details. As long as the grocery stores are full and the basic need for sustenance is met, it's just another (legitimate) reason to be glad to live in America. I saw Little House and Field of Dreams a long time ago. What I remember most about them was how they were delivery systems for "traditional" ideas about family, tradition, and faith, themes that went a long way in shaping our current political discourse. There's a purity in the idea of living off the land that political conservatism has incorporated into its reaction against the newfangled ideas that come from large cities like ours. But as people across the world continue to migrate from rural areas to large metropolises, I wonder how this notion will change. In another few decades, it might make more sense for Clover and Aubrey's story to take place in a corporate field office rather than a family estate. Share September 15, 2017 • http://chrp.at/1qhD • Share on Facebook • Tweet This!